Data and metric dashboards for the sake of data and metric dashboards serve no purpose. You need to go deeper to gain insight and action. Analytics metric dashboards are fun and by fun, I mean they are miserable. For a digital marketer, the analytics metric dashboard is akin to looking at the crush of your dreams and having no conception of how to act on it. The point being, analytics metrics dashboards are a one stop shop for data visualization, not data action. 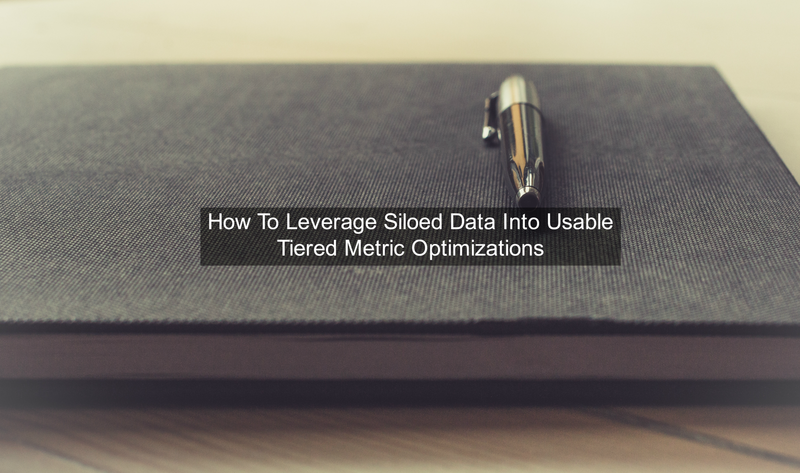 In this quick post I want to explore the topic of why silo metrics serve you no purpose, what tiered metrics are and how you can utilize them to build a deeper understanding of your user behavior actions by assigning numerical weighted values per driver and behaviors. Typically analytics metric dashboards are composed of singular metric stats segmented into category and built into silos. This method of “presenting data”, is useful in the sense that it enables baseline talking points for any given online tactic without actually providing deeper analysis of root and systemic issues. Tiered metrics are the linking of silo based metrics — as aforementioned — with the express purpose of understanding where in the overall sales funnel a customer is based on their pathway to site (drivers) and their onsite actions (behaviors). As you might have guessed each stage in the journey is driven by a different set of drivers and lines up to a different set of behaviors given where a customer is within the above listed sale funnel. In the information seeking page, you want to understand where your user is coming from (search, display, social, referral, etc. ), if they are interested in the content/solutions your site is presenting based on their entry point (engagement rates), and if that interest validates itself in the form of user tool interactions (downloads, saving material, bookmarking). By being able to track each metric as a string, you can assign a numerical weighted value (nwMaxValue) to the end user behavior patterns and begin the process of determining which metric factor tied to a specific tactic needs optimization. This value means when enough data is collected the assets which perform below expectation are ripe for new executions, updates, and strategies. 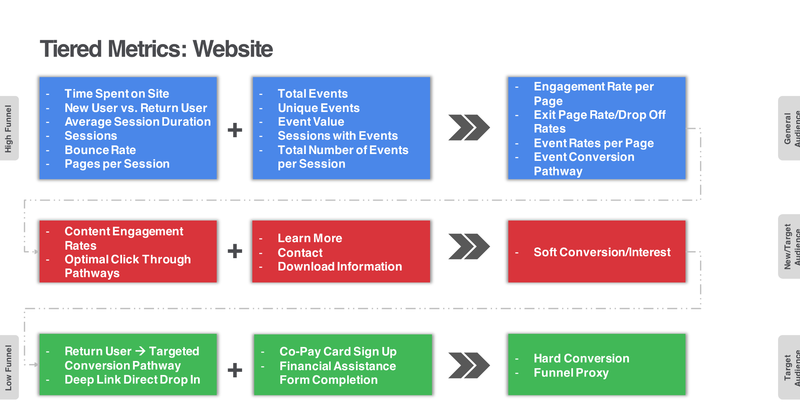 The same value yield allows for optimizations at any stage of the funnel. We will get into it more in a bit, but there is a subtle difference within conversion that is worth exploring when it comes to assigning weighted value of action. The basics of the equation are simple yet key to building strategy and execution from metric results is knowing what drivers + behaviors each customer should be taking at their step in the journey. For a fuller chart, look below. All of that is well and good yet you still have to know what to do with the data equation. This is where our weighted value comes into play. As some of you might have noticed, our max value for Product/User Conversion is scaled at two decimal places. This is done for the specific purpose of weighting possible user action within this phase because conversion carries a different set of defined rules than another base metric. When thinking about converting to a product via a website, the choices are an n of three. There are three options at this phase and as such, our weighted n values follows suit. From here it is pretty simple to understand where action is needed wholly based on our element value. If 2.5, trigger email to user thanking them for the purchase, showing them how they can more deeply get involved with the brand (mailing list of products/blogging thoughts), and tracking information. 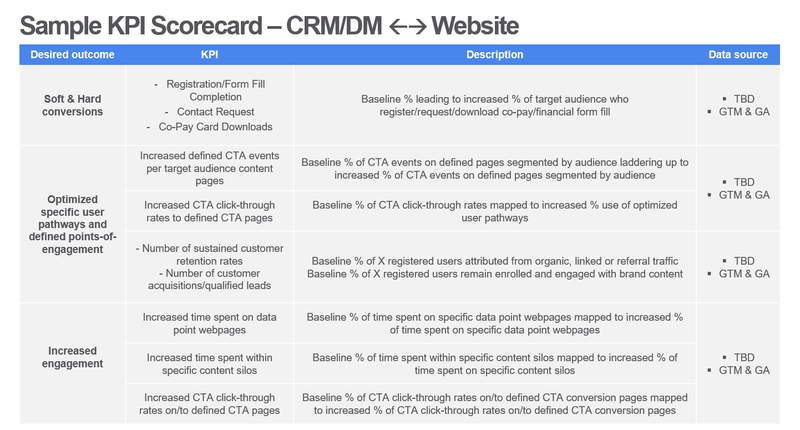 Don’t forget, your metric dashboard and weighted values need to work within a KPI Scorecard which aligns to brand goals and takes into consideration target audience needs. Just as data for data is useless, data and optimization without a target is useless. By providing this level of insight into your own metrics or that of your clients, you will be more actively able to determine benchmarks based on drivers and behaviors, determine obstacles to brand + target audience goals, and optimize accordingly. Again, analytics metric dashboards are nice but in the end, if you don’t know how to ask that crush out, you’re not going to make any meaningful relationships. Brad Yale can be reached for comment at byale@thebloc.com. He hates analytic metric dashboards yet understands they provide value only with insight. Metric dashboards, for the sake of metrics, are useless and a waste of money.